The good days in Tathra will always outnumber the bad days. But in the last 12 months, the bad days have weighed heavily on this town of 1,657 people. The bushfires of March 18, 2018, have left a permanent mark on Tathra. Sixty-five homes were destroyed and the bushland that sits to the west of the town’s famous beach will point to the ferociousness of that day for many years to come. Despite that, ‘normal’ Tathra is very much still at work, even if it is mixed with counselling appointments and building inspections. The Tathra Wharf to Waves weekend is the proof. For the last 18 years, people near and far have gathered for two days of running, mountain biking, and ocean swims each January. And 2019 will be remembered as one of the best. 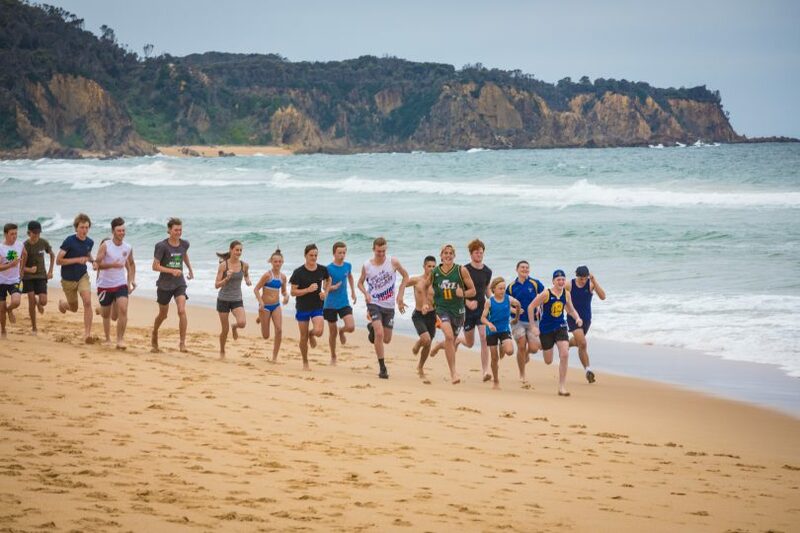 The Bega to Beach Mountain Bike Ride on Saturday (January 19) saw 135 riders take part – the most ever. The 23 km route from Tarraganda RFS shed, along Reedy Swamp and Goats Knob Roads and down into Tathra followed a similar path to that of the fire. The 600-metre ocean swim age races on Sunday (January 20) drew 290 swimmers – the most ever. 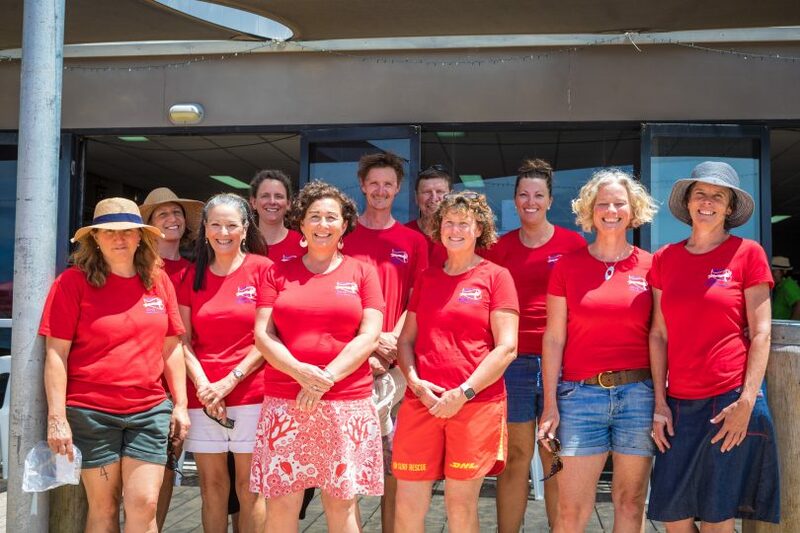 The 1200 metre Splash for Cash ocean swim attracted 183 swimmers – the most ever. 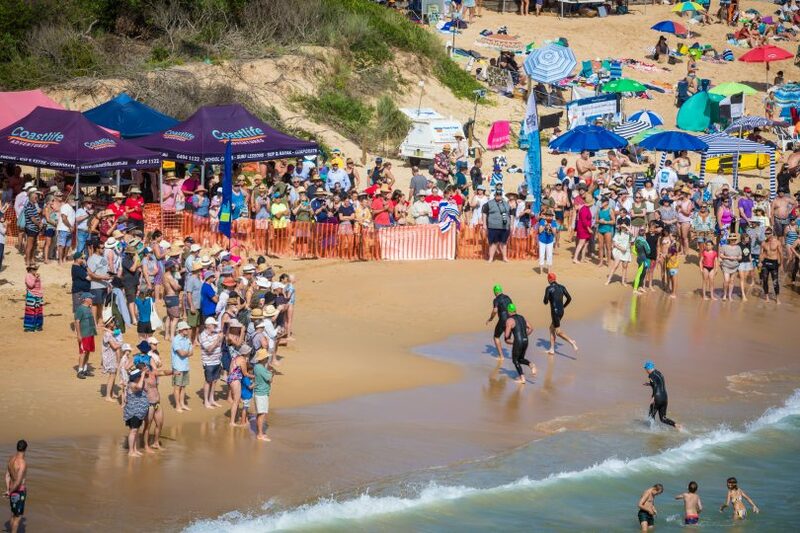 Despite the blue bottles, conditions were perfect – flat sea, next to no wind, water temp 22 degrees, and a big crowd on the beach to cheer you home. While the popularity of the event has been building, the response in 2019 is more than just simple momentum. 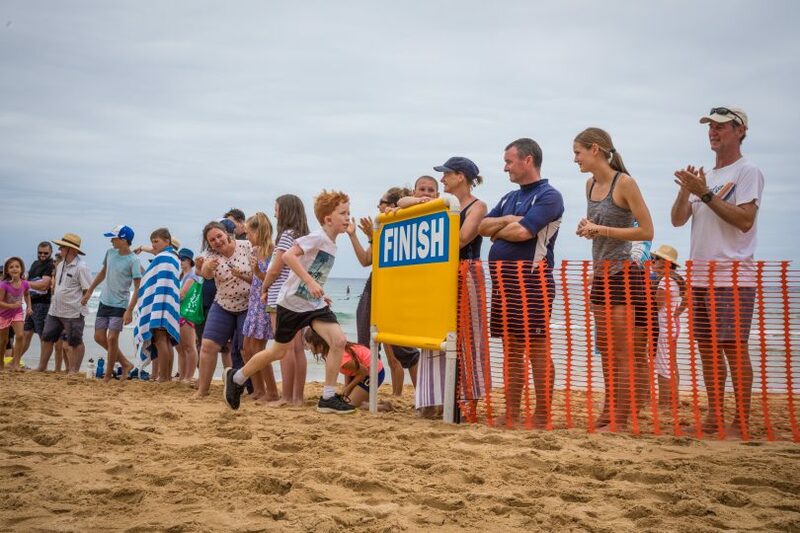 This year’s Wharf to Waves is the biggest ever, a show of strength from within Tathra and a show of support from those outside who love Tathra. The weekend works because around one-third of the town’s population volunteer their time to make it so. 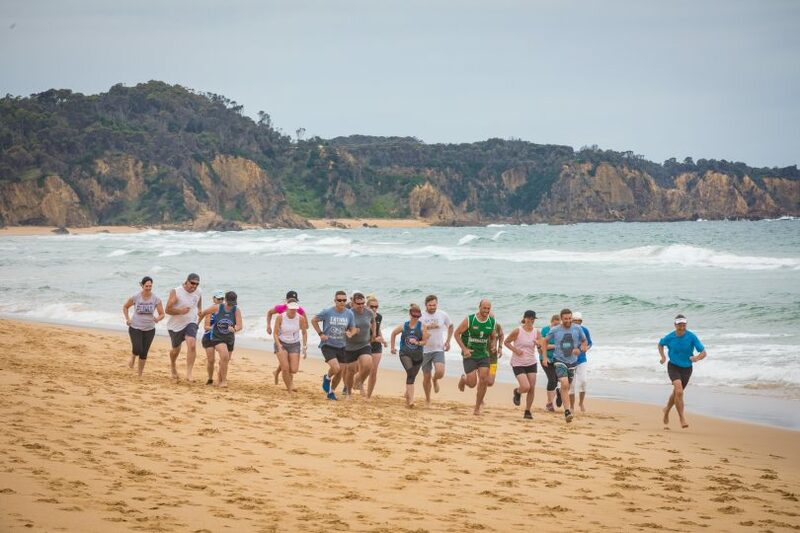 It’s an effort that raises $30,000 for four of Tathra’s key organisations – the surf club, primary school, preschool, and Rural Fire Service. These are the people who stepped up on that hellish day last March and are the people who have put Tathra back together in the 10 months that have followed. For the record, Victoria Bushell won the Women’s Splash for Cash in a time of 15:37. In the men’s, Nicholas Allnut pushed hard to finish in 15:30. Both teenagers went home with $500 cash and a framed print from Five Four Photography. The brilliant blue day was also used as a backdrop for the town’s ongoing advocacy on climate change. 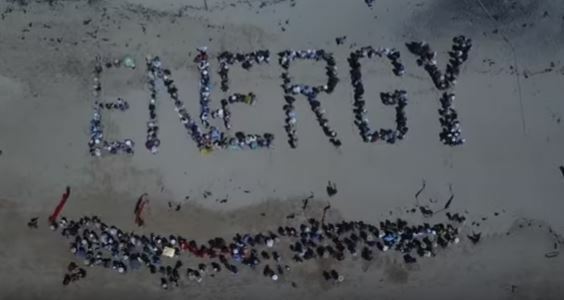 Dr Matthew Nott and Clean Energy for Eternity shepherding hundreds of people from out under beach umbrellas to fashion a human sign – Renewable Energy, Now! The 2019 Wharf to Waves is one for the history books. The 2007 event is remembered for its huge waves and swell which forced the ocean swims into the calm waters of the Bega River at Mogareeka. In 2008, the Korean Triathlon Team competed as part of their Olympic warm-up, and in 2009 the crowd was charmed by NSW Governor, Professor Marie Bashir. 2019 will be remembered for its show of strength and support in the wake of bushfire. In 2020, the Wharf to Waves weekend is January 18 and 19 – circle the date in your diary now. Enjoy our photo gallery, the images are from the official event photographer Kit Goldsworthy from Five Four Photography. Bega Police ready to ride, left to right: S/Con Dave Kelly, Sgt Jo Mayer, Wyatt Pursell, Chief Inspector Peter Volf, S/Con Dave White, S/Con Darryl Redman, Const Peter George, S/Con Chris Reeve. Photo: Clean Energy for Eternity.